You be sure that you will find your own personal favorite in our collection: Perhaps it is the filigree filed steel key that a lock master produced by hand and the sweat of his brow from a single piece of steel. Or it may be the small cast iron donkey that is transporting matches in his carry baskets. You may also decide on lock from Africa decorated with a carved turtle, one of the most important animals of the Dogon tribe. Best of all, decide for yourself! It is this that separates us from other museums: We are not specialized in a single field, but rather interested in a variety of topics. One of these is the locking principle. Going back to the Stone Age, humans have tried to protect their property from wild animals. This is how the door was invented. To make the doors more secure against the entry of strangers, mechanisms were invented to lock them. This is how the first locks were developed. In our exhibition however, we not only show keys and locks, but many objects that could be locked: offertories, coffers, cabinets, handcuffs, chastity belts and much more. Of particular note here is our collection of caskets. You can see caskets made of tortoise shell, ivory, leather or even caskets with miniature paintings by Balthasar Wiegand. Unique are the rock crystal caskets that were owned by William Beckford, as well as a fascinating iron casket with five clocks on the lid. View the large collection of Michel-Mann caskets and learn why, in the Middle Ages, it wasn’t flowers and chocolates that were the most desired gifts, but rather carved wood caskets. Another topic that we focus on is the raw material iron. This material was once used for the manufacture of a wide variety of objects. They were found in every household in the 17th/18th centuries. Waffle irons, cork presses, door knockers, hinges as well as the busts of politicians and authors could be found in every middle class household. An cast iron jewelry should not be forgotten that you can see here in the form of delightful bracelets and chains. 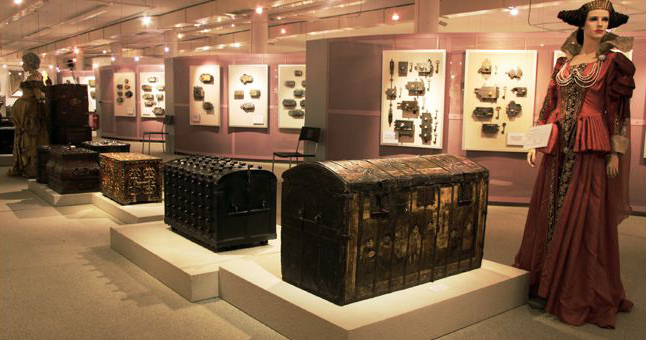 Another area that you can research here is the department of African and Asian objects. Here you can see a direct comparison of the development of locking mechanisms on both continents in contrast to Europe. In this department you can also see many pieces that Hanns Schell brought back himself from his expeditions to Africa and Asia. If you would like to know more about the travels of Hanns Schell and his friends, then please visit us at our museum.